For as long as people have wanted to trade, Gold has been pulled from the Earth and smelted into coins. These coins can be found coming from nearly all corners of the globe, often with a tiny glimpse of history etched or molded onto it. Usually Gold coins represent the most valuable pieces of currency. Because of their lustrous nature and fantastic resistance to rusting away, Gold coins are a solid investment. The value of Gold coins is highly variable, due to the wide diversity which makes them so collectible. Condition of a coin plays an immense role in determining value. For instance, a $2.50 Liberty 1840-1907 piece is valued around $229 at Very Fine quality, and $361 at Uncirculated quality. Naturally this price fluctuates with the value of gold. 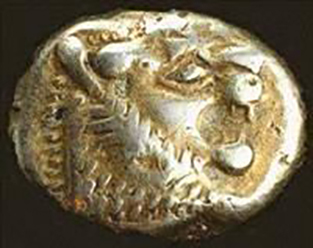 The oldest Gold Coin (pictured above) is more than 2700 years old, originating in Lydia, which is in Anatolia. Found by a diver in the Black Sea, the Fleur de Coin was punched by hand and resides in a key exhibit in the Department of Coins and Medals of the British Museum.